An inventive one-man comedy from Adrian Lancini. Oddball characters and satirical skits featuring a host with his own language, a fishing net and a load of rubbish. 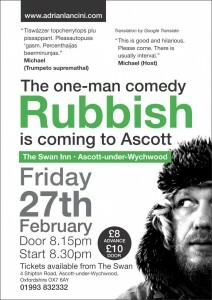 FRIDAY FEBRUARY 27th AT THE SWAN. 8.30. TICKETS £8 IN ADVANCE FROM THE VENUE. Visit www.adrianlancini.com for more information.